The line that separates the public from the private sphere is arbitrary, but fiercely policed. On Easter Monday, a day of goodwill and redemption, between 600,000 and 900,000 households will either have to move out of their homes or have their benefits cut(1). The reason is that they are deemed to be under-occupying their property: in other words they have one or more spare rooms. The bedroom tax will hit some of the poorest people in Britain. Two years ago I proposed something similar(2). Nearly 8 million homes in England, I found, had two or more spare bedrooms. But only 11% of this under-occupation was in public or social housing. The rapid growth in half-empty homes, according to the government, “is entirely due to a large increase within the owner-occupied sector”(3). Because of the desperate shortage of housing, especially for larger families, I suggested a bedroom tax for owner-occupiers. It was a much gentler measure than next week’s tax, as it would apply only to those with at least two spare rooms and would affect only those most able to pay. The response was an explosion of fury in the right-wing press and blogosphere: the places where the current bedroom tax finds its only supporters. In the Telegraph, Ed West remarked that my idea was “far closer to fascism than the ethno-centric populism of the European radical Right. … The state has no business in people’s bedrooms – ever.”(4) I am still waiting for Ed to denounce the state’s intrusion into the bedrooms of the poor. The difference, of course, is that because housing benefit is paid by the government, the government is deemed to possess the right to withdraw it. But much of the wealth of private householders has also been provided by state. The value of our homes, for example, has been greatly enhanced by the infrastructure and public services the state provides(5). Yet the proposal to reclaim some of this unearned wealth through a land value tax is angrily dismissed by the party promoting a bedroom tax for the poor(6). Similarly, every year taxpayers in this country spend £3.6bn on farm subsidies(7). We could by now have bought all the farmland in Britain several times over. But this money has earned us no property rights: farmers still feel entitled to announce at public meetings that “it’s my land and I will do what I want with it.” Most of the land in this country, if you go back far enough, was seized from other people, often, in the case of the commons, from entire communities. Much of the law we abide by today was drafted to formalise these seizures. There is a sacred line that divides the world into public and private property. The line is arbitrary and moves every year: ever further across the public realm. But it is policed religiously. As soon as you can bundle the public wealth you’ve snatched over the line and into the hallowed ground of the private sector, you can claim sanctuary. Among the Russian government’s backers are oligarchs who were enriched by acquiring government assets at a fraction of their value. Their political alliances have ensured that their wealth is neither questioned nor reclaimed by the government. But when the government of Cyprus plans to acquire some of the assets stashed by tax-avoiding oligarchs, the Russian prime minister denounces it as “stealing”(8). When the threshold is crossed, everything changes. Money spent in the private sector is deemed by politicians and the media to be a good thing. Money spent in the public sector is deemed a bad thing, even though (or perhaps because) it is more effective at distributing wealth. If you are on the right side of the line, the government will deregulate your business. If you are on the wrong side of the line (schools and hospitals for example), it will subject you to ever more draconian regulation, with cruel and unusual punishments for the slightest resistance to its crazy targets and intrusive inspections(9). Gagging clauses in NHS employment contracts are rightly denounced by ministers(10). But what of the gagging clauses deployed by banks or oil companies or insurance firms, which shield their malpractice from public scrutiny? Where in the media or in government have you heard a call for those to be removed? And why should freedom of information laws stop at the fence marked “private: keep out”? Why, for example, should we not have the right to know what the banks are cooking up? Take a look at the astonishing chart of property wealth published by the New Economics Foundation and you get an inkling of why attempts to challenge the concentration of private property are denounced as fascism(11). 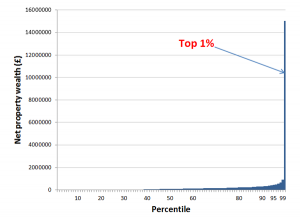 The graph, using government statistics, suggests that the average property wealth of the top 1% of households is £15m. 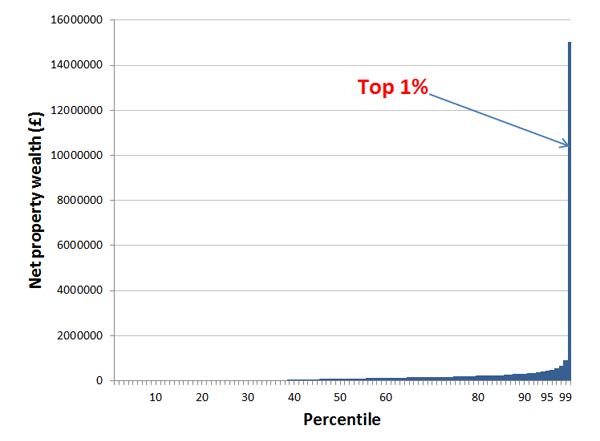 “The 1% are worth more than the bottom 99% put together.” [Note added, 29th March: this now turns out to be inaccurate. Please see the correction below*] By focusing on income rather than property we have gravely underestimated the extent of inequality. Net property wealth, United Kingdom. New Economics Foundation, data from Office of National Statistics. All this is blasphemy: a trespass into the holy shrine, which has been sanctified by a thousand speeches and editorials. But there is nothing inherently sacred about the veil of the temple that divides the two realms; nothing, as Easter approaches, that must forbid it from being rent in twain. “The ONS property wealth figures you quoted from our blog were given to us directly from them last August, and we’ve been using them in our inequality work since then. “Over the last 24 hours, however, we’ve been having some further discussions with the ONS about the data they supplied us. They have confirmed that one of their table headings was not properly labelled, and this morning we made some minor amendments to our original post to reflect this.